Ok so we're living in our new home just over a year and I'm still debating our lighting over the kitchen island. I wanted 3 single pendants with clear glass, nice and simple! Now our electrician says this will be a messy job because of rafters etc. He suggests a single light fixture will be an easier and cleaner job. The room is an open plan kitchen, living space with lots of recessed lighting. I feel a light fixture over the island will give it a nice finish but I'm worried may look intrusive and maybe not necessary. Guess my decision is to plaster the light fixture space up or brave it and try a nice fixture. Would love some advise before I crack up!!!! 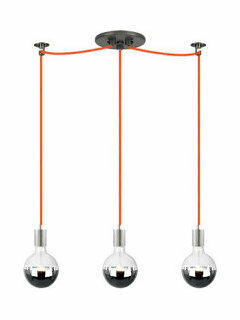 Attached is a light idea I liked in a showroom today. Our ceilings are 9 foot high. I would agree with your electrician, having separate light fittings/pendants would be a less easy, messier and more intrusive job than having one fixture. I Certainly wouldn't plaster over and make do with just the recessed ceiling lights (if that is what you mean). I like your choice of fixture but I would wait to see what suggestions others here will come up with. 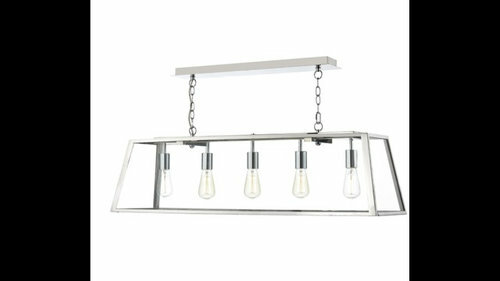 If installing extra pendants isn’t an option, something similar to this modern chandelier could work really well. This particular fitting is from Made.com, however there are lots of alternate options out there! 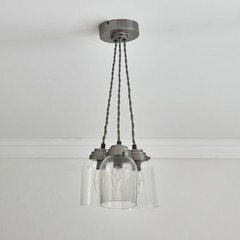 Feel like I've trawled so many websites looking for light fixtures! I bought this one for kitchen tho I’ve still need to put it up yet. https://www.wilko.com/wilko-triple-glass-industrial-pendant-pewter/p/0436640 Cheap as chips! Also got it when they had a sale on:) The glass is a little thin and looks fragile but the cords are adjustable and I hope to do similar to previous comment and to swag them on ceiling hooks (hook in pic is from Creative Cables). I too was trawling through many websites and thought I’d go for a cheapy till I find one I really like. Nice kitchen, I like the light fitting you have found. 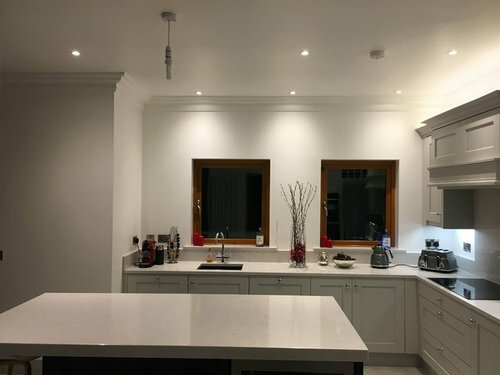 I have something similar, I would suggest a dimmer switch as the bare bulb look is great but very bright, it would also mean you create an atmosphere suited to work or eating! 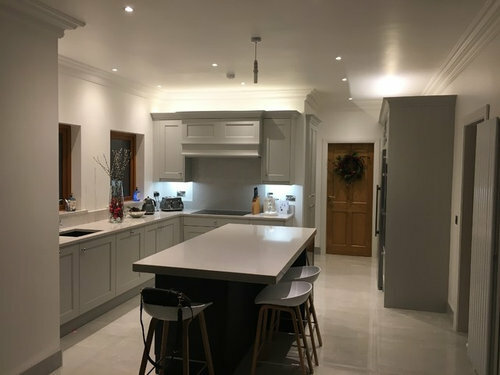 I also think the light fitting you found is a great choice..
Lovely kitchen! 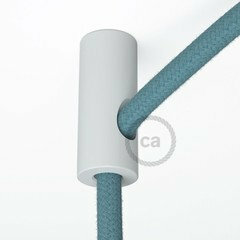 What are the measurements of your island and the measurements of your light fitting? Is the light in your photo hanging over the island right in the middle? So if you have a single pendant then the electrician just replaces it or will the new light have to be re-aligned to the middle of the island and the existing light 'hole' will have to be plastered/ filled up? Another thought it is, if you have a heavy light fixture, you might need extra support within the ceiling, I remember my electrician asking me what sort of pendants I was having over the island and if they were heavy then they may require extra support within the ceiling by using/ attaching the cables to noggins if the cable was in between joists. I guess anything is possible, messy job usually means you will end up spending more money, does he mean messy job for him or messy job in terms if you have to get the ceiling re-skimmed, painted etc? If the room above is carpeted, you could take the carpet up, take a couple of floorboards up and he could do the cables from the room above? That would be easier for him but a disruption for you. I still don't understand why it would be that messy for him, as long as there is an exisiting cable and light ( which there is ), I'm sure he could use that to create 2 more extra lights as they will be using the same switch. Then again I'm not an electrician lol, just going by my experience from my recent building works :-). I've just come across this, looks like a similar style light to the one you like..
Area around new inset stove - I could do with some advice! Need to hide bathroom and toilet pipes!